Tester: Hispanic (Dominican) about America Ferrara's complexion with combination skin and occasional break outs. "I have combination skin which gets very oily and shiny in my T-zone area. I judge how well a powder works for me based on how this area looks about mid day after applying first thing in the AM, and then how much more I need to get me through the end of the day, in addition to how it makes my skin look and how it feels on my skin. With this powder I was very impressed with not only how well it kept the shine down, but how nice and finished my face looked, whether I applied foundation/tinted moisturizer first or not. On most days after using this powder, by the afternoon I just needed a small reapplication, which took me through the end of the work day. The color of the powder itself is white in the case, but translucent on the skin. This was great because it was "goof proof" to get a flattering match to my skin tone*. There is no real fragrance to speak of and it has a nice texture. The powder was smooth going on the brush and silky on my skin. The finished look was matte, but with a nice brightening effect, so that it did not look like a mask. It was also easy to take along in my day or evening bag with the retractable kabuki brush and the magnetic closure on the powder case. Cynde has a great product here!" V.D. *Editor's Note: You must use the powder according to these instructions: sweep the brush onto the powder, then sweep on the back of the hand to diffuse the particles further. 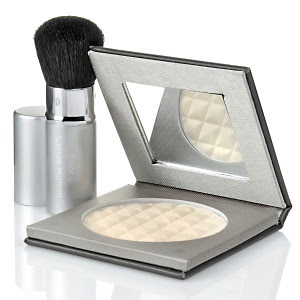 Then apply to the t-zone first sweeping outwards to the rest of the face. If you apply the powder straight from the brush on to the face you will get a whitesh cast on your face which will also be prominent if you have darker brown skin. Go-->Available on HSN. Retractable Kabuki brush is also included.